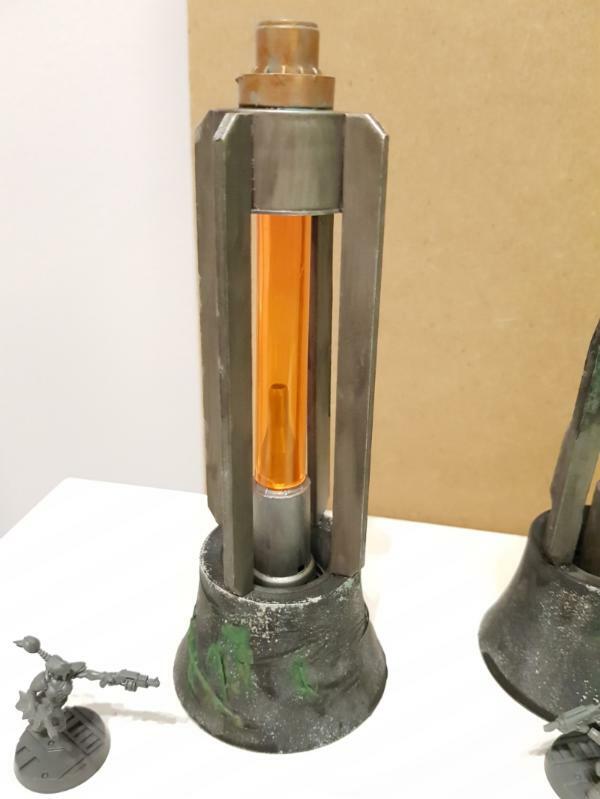 lovely piece...the weathering looks really good...my only nitpick is the batteries...i think there needs to be some kind of different colour...to make them more convincing...also...maybe add to the upper part of the pistons some hazard stripes? 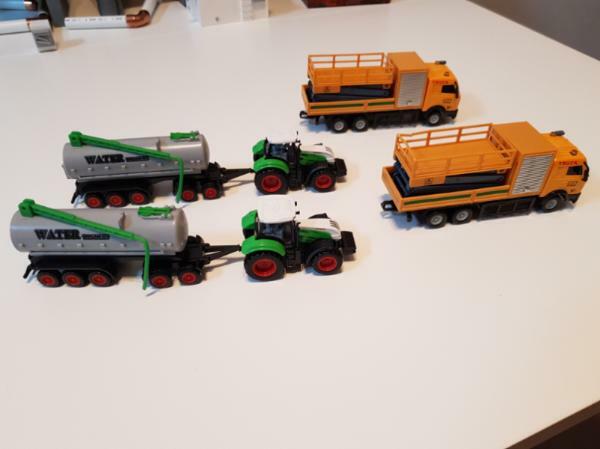 So.i wasted some more money on some.super cheap toy vehicles with interesting payloads. And turned them.into some more scatter terrain. 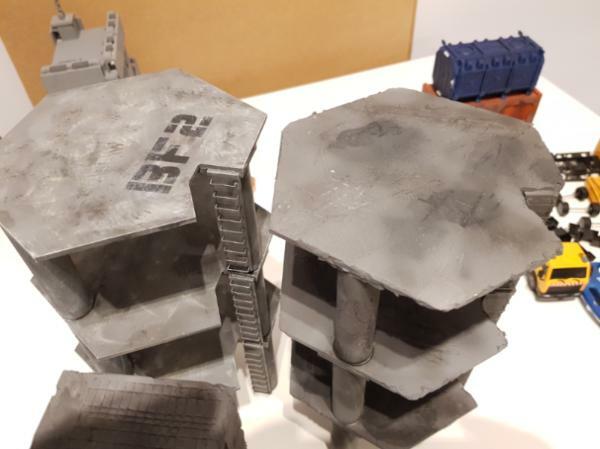 I'll.probably stick the water tanks down to something else, either a couple of small.individual.bases or as dressing to.some of my existing larger buildings. But I've not been totally neglecting things. 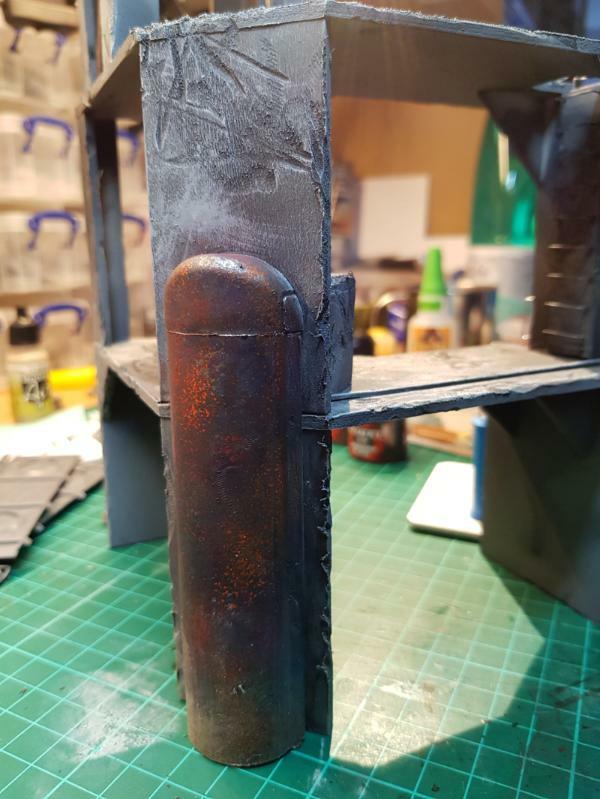 Look undercoated and airbrush mottled scenery! I just need to vigorously drybrush them a few other grey tones and maybe add another dirty wash to some specific parts. Oh and then transfers for numbering and graffiti. Interesting vehicle finds. 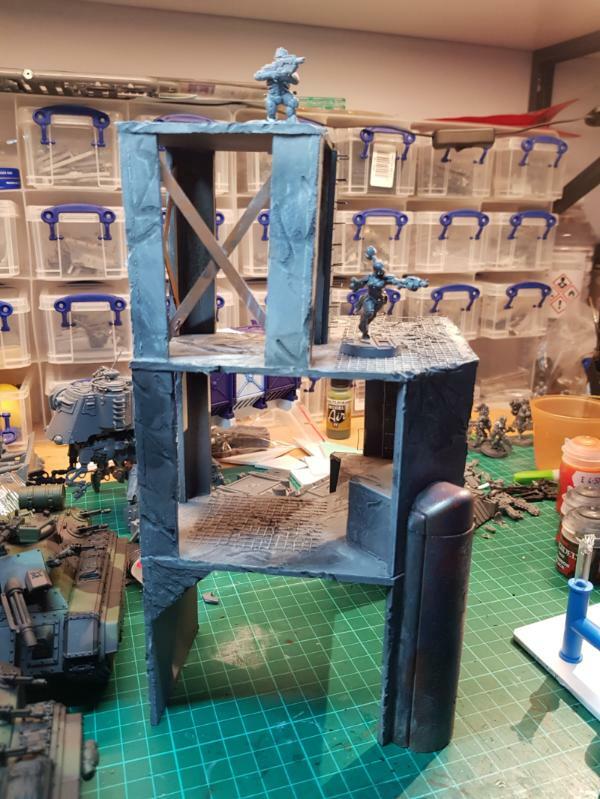 Terrain is looking good. Woohoo. 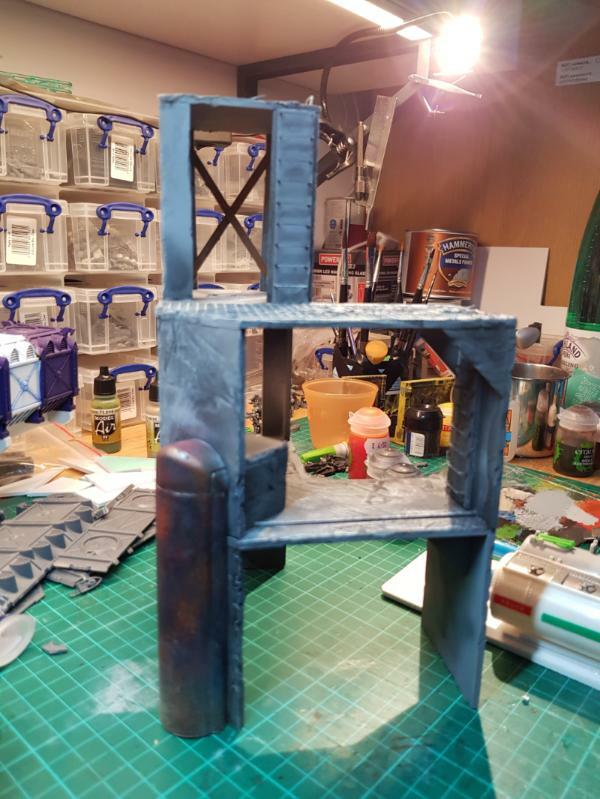 A bit of progress and another tower complete. This one is a bit grubbier than the last one so no markings for now. I will probably add some graffiti decals in due course. And even a new little bit of tankage made from the super cheap toy cars I got recently. I've now just finished going through your whole thread here, looking for ideas to steal, err- pay homage to, yeah, that's the ticket! Unbelievable imagination here- everything so well done and new things flying out a mile a minute! 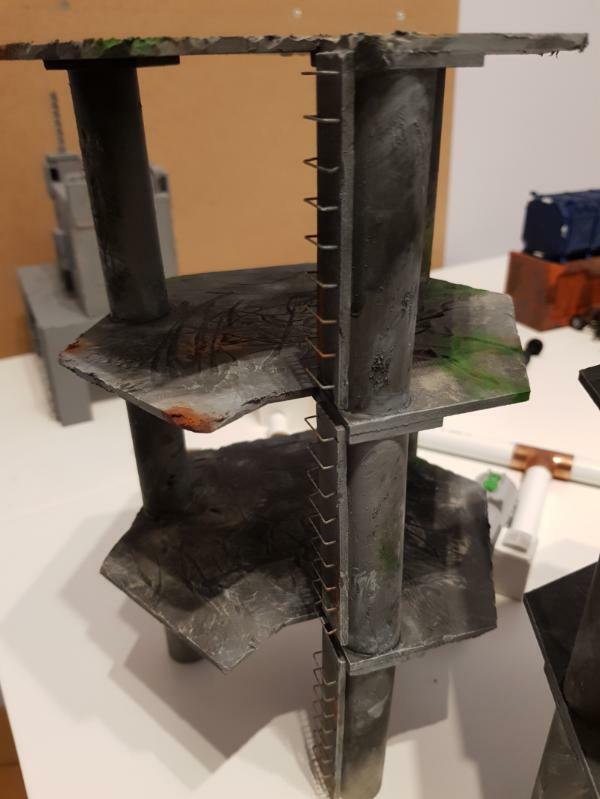 To do so much with basic foam board and bits, truly well done. 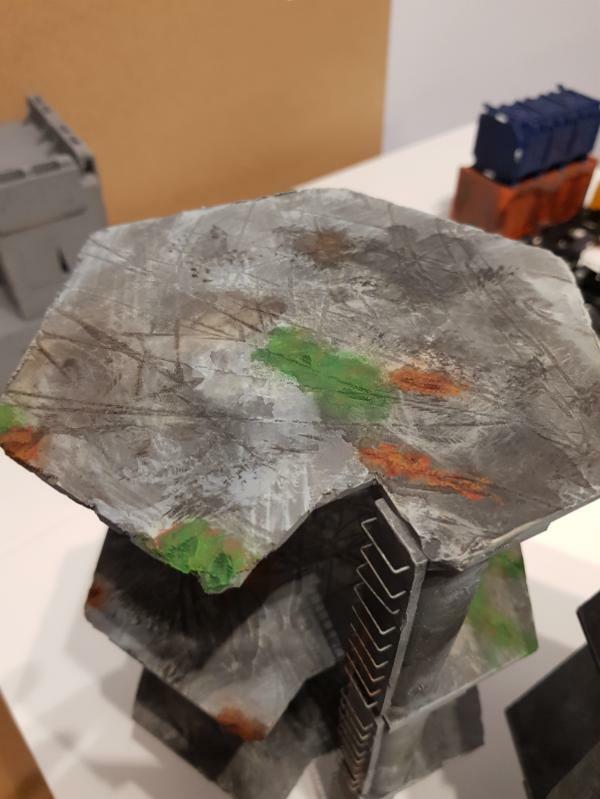 The Skitarii crawler based cargo hauler- holy cow. I've got a _lot_ to learn here- thank you! New tankage is nice, as is the tower. 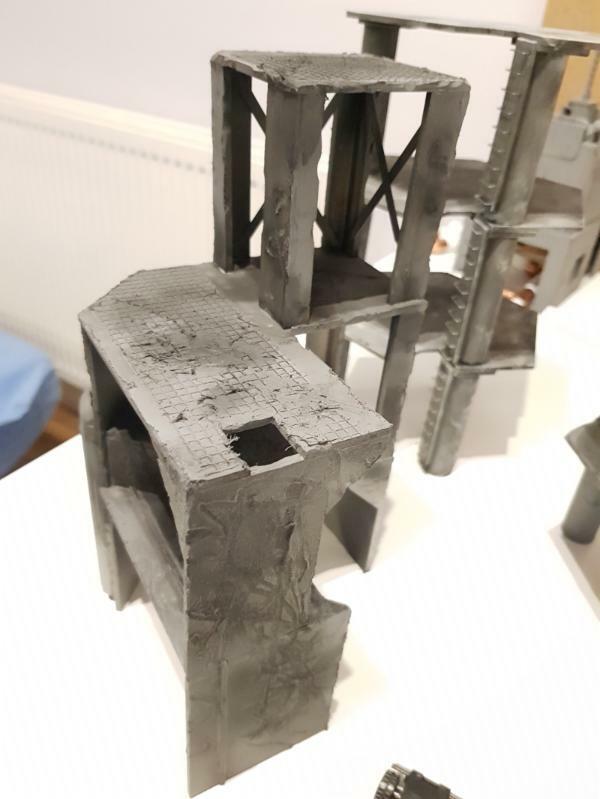 What's that you used as buttresses on the tower? 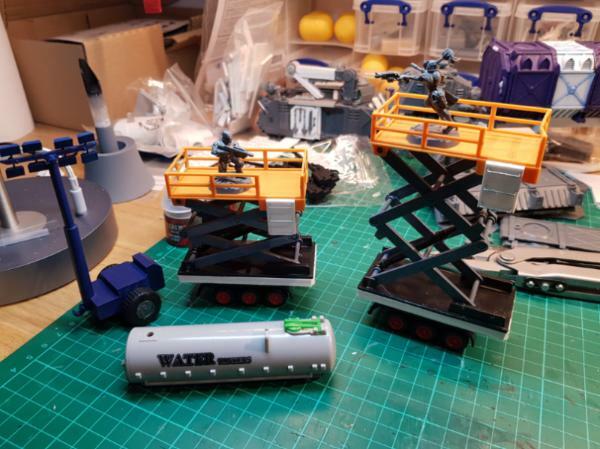 Clever use of the toy tanker trucks, Flinty. They'll look nice and convincing when painted up. Thanks Shrub. 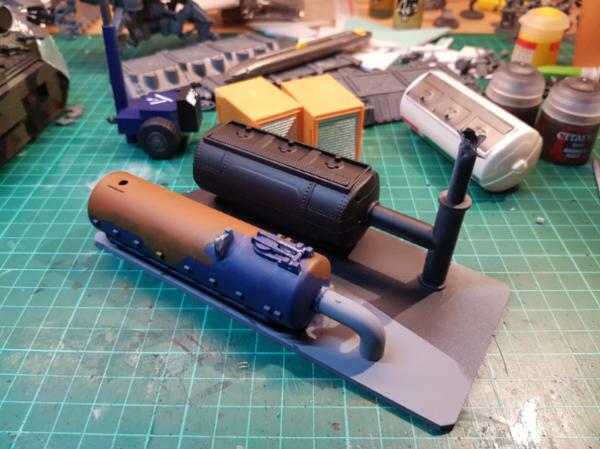 Heat in hoping that just a quick grungy paint job will look quite convincing on them. @monkeytroll. Sorry, i may be misunderstanding but there are no buttresses on the tower i just posted. 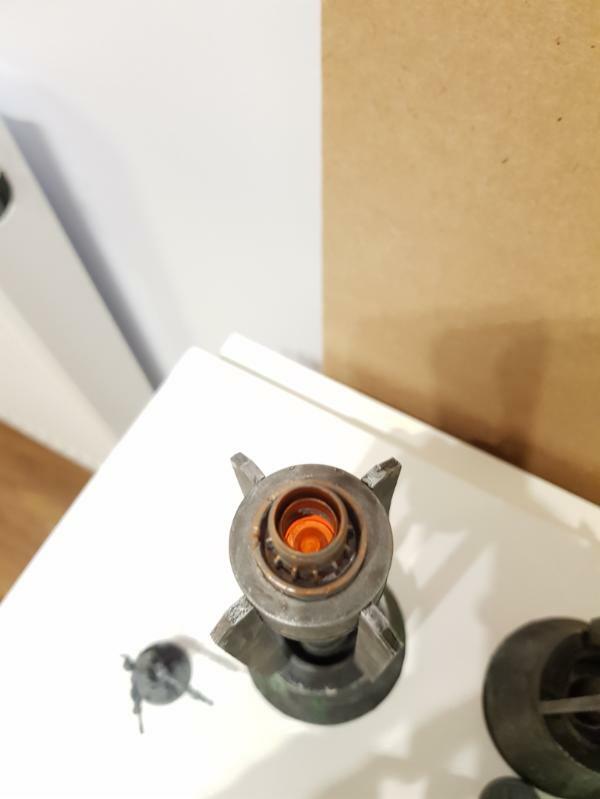 The rounded thing on the corner is a bit of cable containment that I had spare from running AV cables at home and it seemed to fit at 32mm scale as well. If you meant the columns on the octagonal towers, they are commercial plastic water pipe from a local.diy store. 15 or 20mm diameter iirc. Yeah, buttresses wasn't the right term to be fair, it was the cable conduit I was referring to, for some reason I thought it was on each support rather than just one, so my brain just reached for buttress when I asked. Sweet work Flinty, good you see you getting some paint on these. WIP on my new tank feature. That's the base coats down. Now to sponge on a variety of other colours to make it look all.scratched and beat up. Almost sad to see such lovely straight and crisp hazard stripes damaged by weathering . Nice work on the most recent towers . Thanks Theophony. 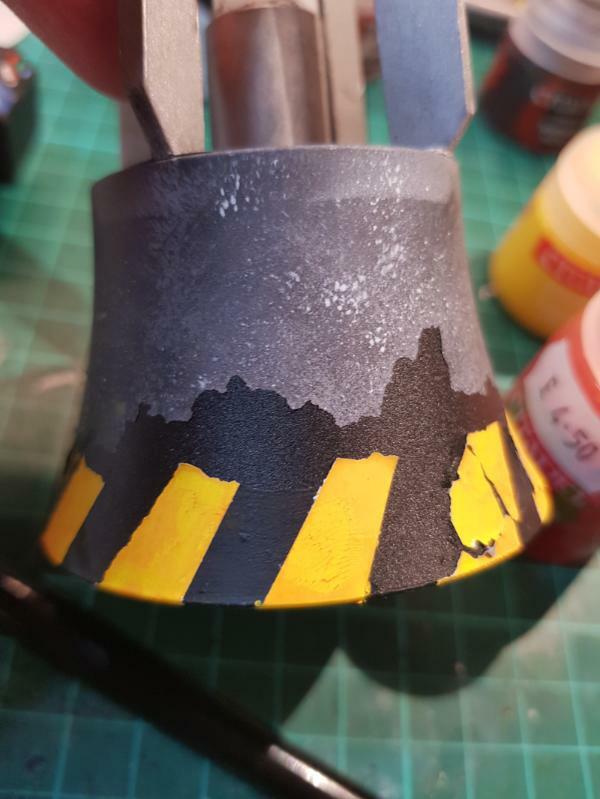 For the hazard stripes, I just use masking tape so they are super easy. I go black first then mask the black off to spray white. 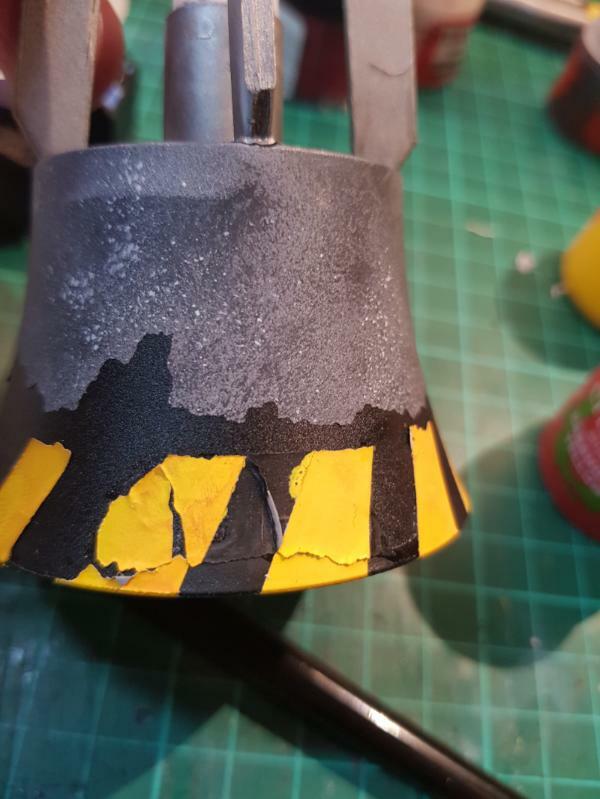 I then leave the masking tape.on and put a couple of coats of sunburnt yellow and a good helping of Cassandora yellow wash. A little tidying up is needed to catch leaks, but tidying up the black over the yellow is easy enough. For the weathering I was thinking some heavy messing around the edges but leave the majority of the stripes intact. The other tank is supposed to be rusting heavily on the top but reasonablyintact lower down, so again heavy sponging at the interface but leave a fair chunk of the blue visible.lower down. 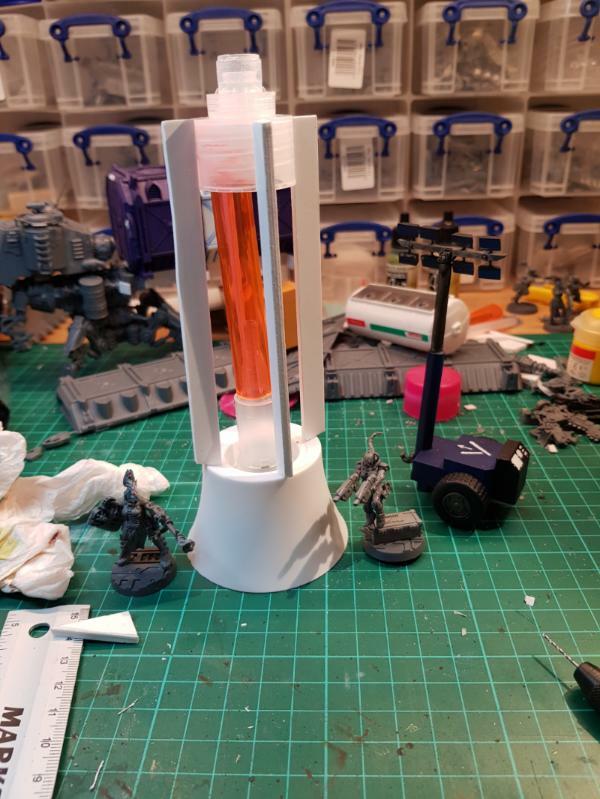 Cross posted from the hobby motivation thread. Ah-ha. I've now gots me a Hidden and I can get back to not playing WoT endlessly! So here is the final draft of the plasma generator heating system element thingy. 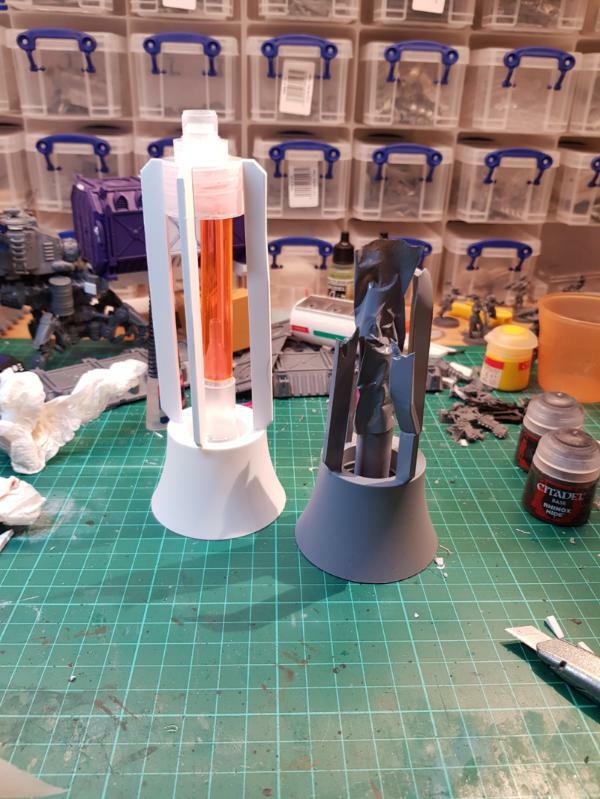 The coloured tube isn't glued in yet because I'll do that after painting the bits, hence it's a bit wonky. 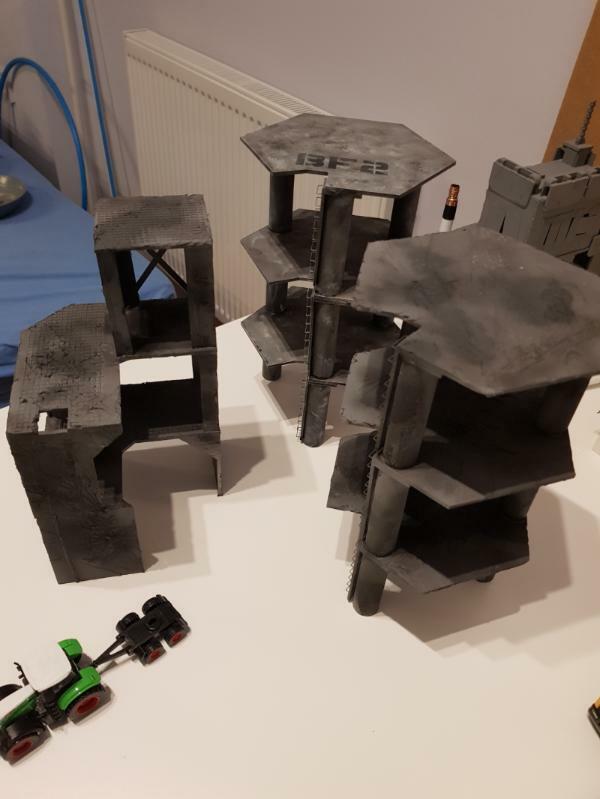 And then the busted one with some busted support pillars now that I've decided on the final details. Great bit of terrain, Flinty. Bottle caps, and bottles in general, are excellent for this sort of things since they come in a massive (and useful) range of shapes. 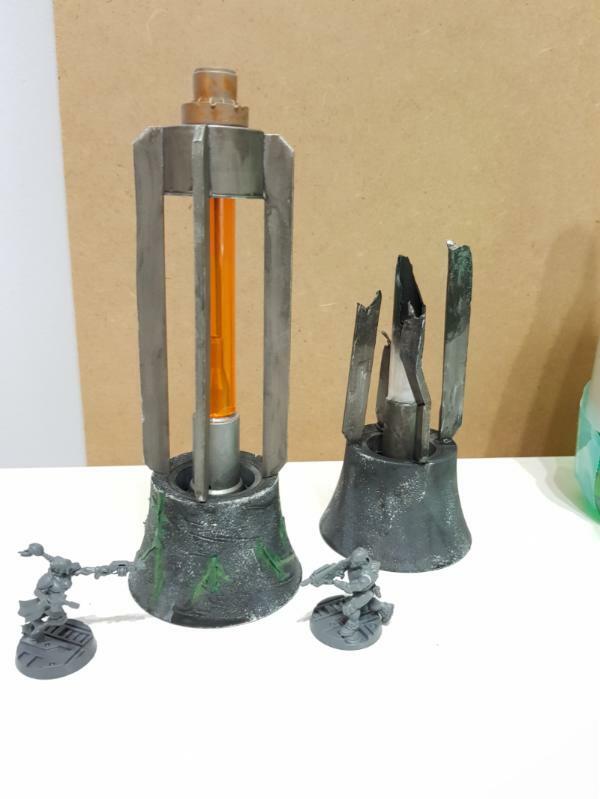 I love the plasma generator heating system element thingies! 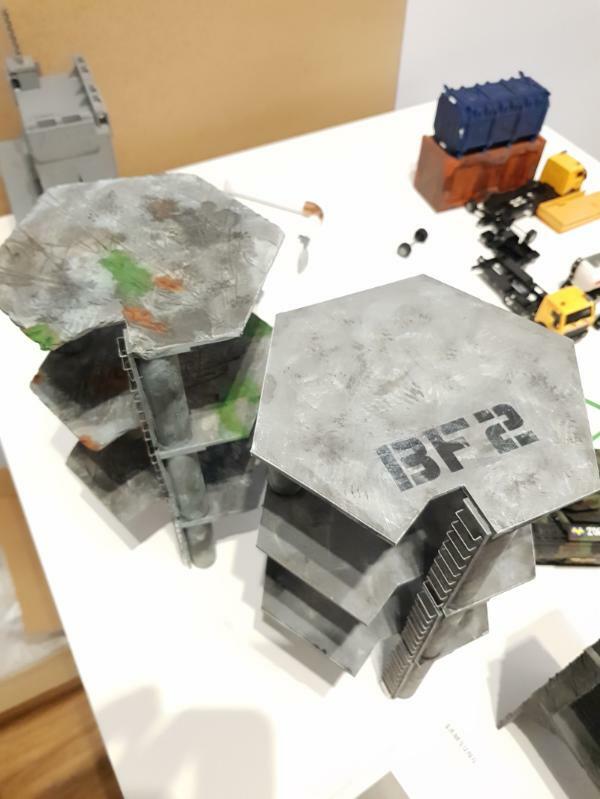 Terrific terrain bits! Especially when they're made of salvaged/scavenged bits and pieces! I'm motivated to try something similar now. The superglue isn't very super either. Oh well it seems to be ok as long as I don't actively pick at it. I'll just prime it up again and leave it alone. Yes I have noticed that over the years that toy's and plastic bottles and lids are often very glossy and do not take the primer well if at all. Eh even with the unfortunate handling damage, it still looks good. It looks right even. A little bit of chipping around the black areas and you'd never know it wasn't supposed to be that way. The lid was already textured as well so I thought it would work. Oh well... no big deal. 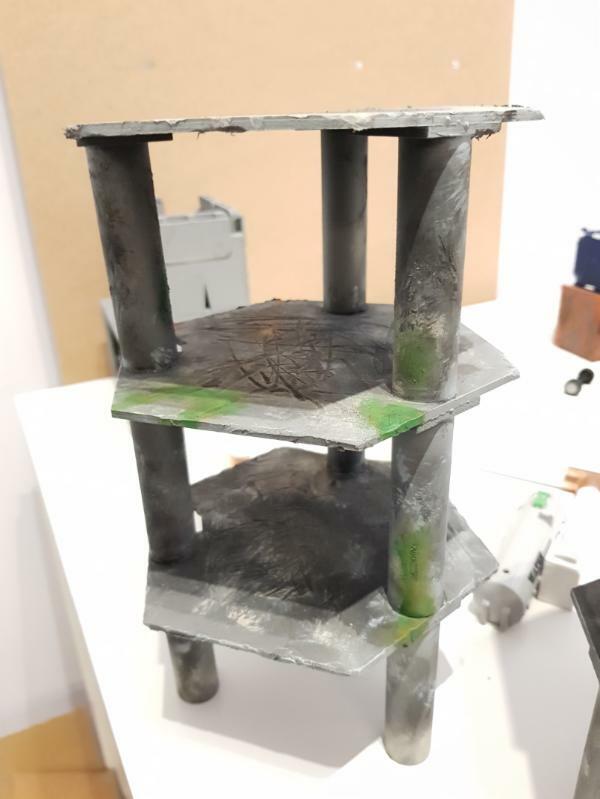 I did think about just working around the damage but in my head it's a concrete plinth with gubbinz bolted to it so any bits being jet black just didn't seem right. Its fine, I just need to do a few layers of grey sponging to get back to where I was. Not too bad. 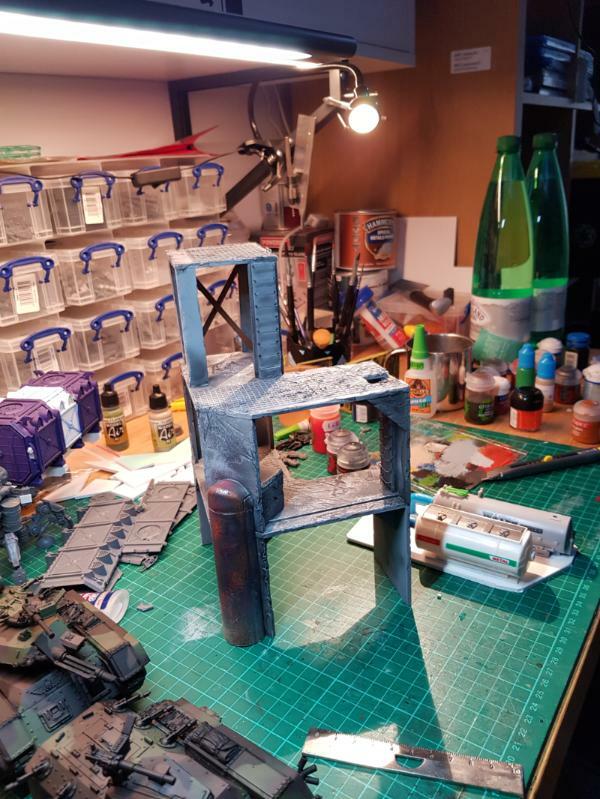 For things made of soft or slippery plastic I use Rustoleum as the primer, and then put a basecoat of real primer on top of that, so everything sticks. 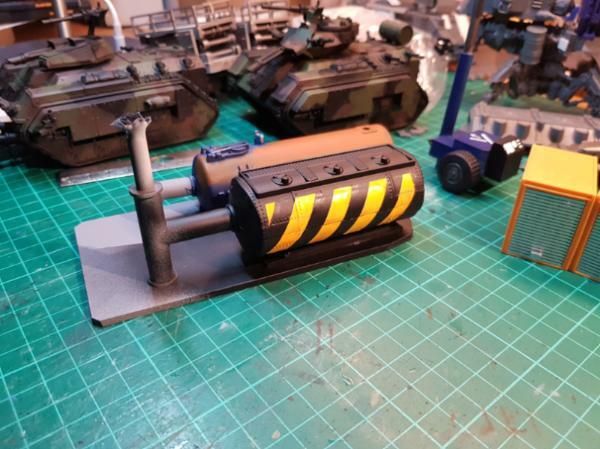 I like the damage hazard stripes too- there's a technique in model railroading to put down the base color, then lay down some rubber cement then paint the top color, then pull the stretchy rubber cement away to leave tears like that- you've got it without trying! Me likey- nice plasma thingies! 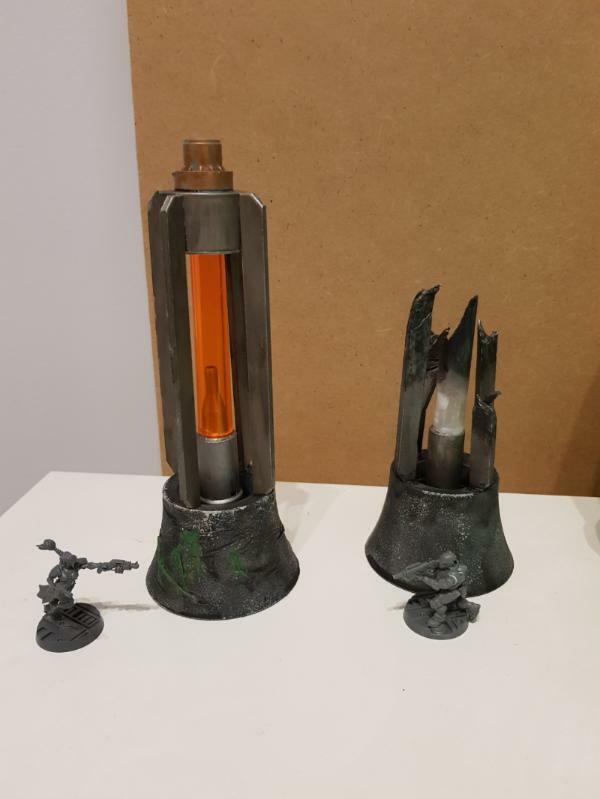 And I absolutely love watching you guys take random bit of what would otherwise be 'junk' and fashion something incredibly clever from it- well done! 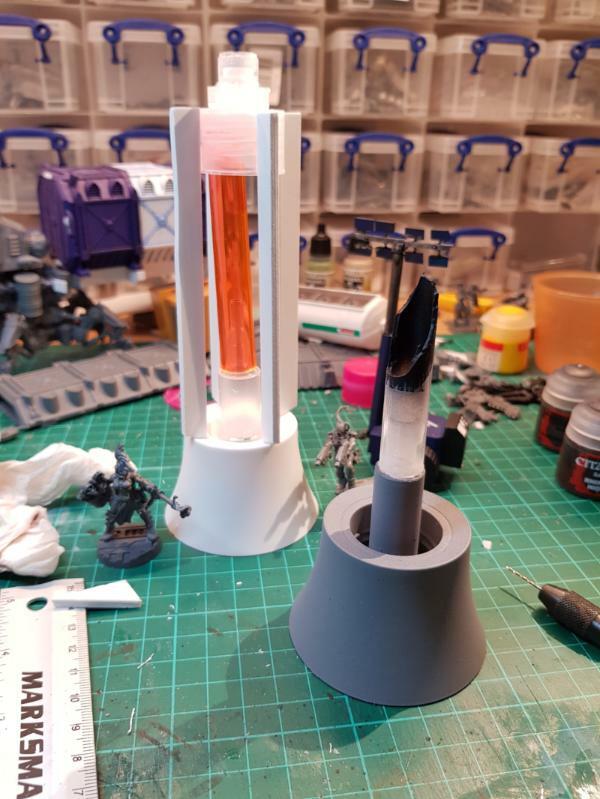 So stealing that plasma core idea. Well done, good sir! I totally forgot to add some little imperial eagle thingies from the Munitorum container kit! Oh well, too late for this one, but I've got a blue bubble.solution tube lying in wait for the next set of cast off bottle tops,.so I'll probably do one more. 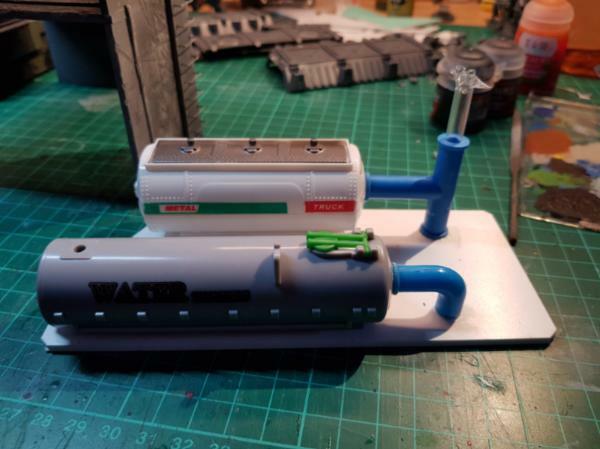 It does take some experimenting to find the right level of consistency for using INSTAR in an airbrush, it doesn’t need a lot of thinner and a little goes a long way so you’re better off using a dropper to thin the paint before firing it through the gun.